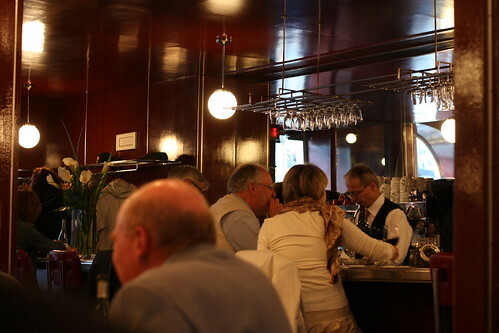 When I planned my Montreal portion of my Canadian trip, I had my eyes out for L'Expresss, a quaint, yet ever popular French Bistro located in an area known as Plateau Mont-Royal. However, the lack of meals did me and my travel companions in and I figured I had to skip this popular Montreal eatery. 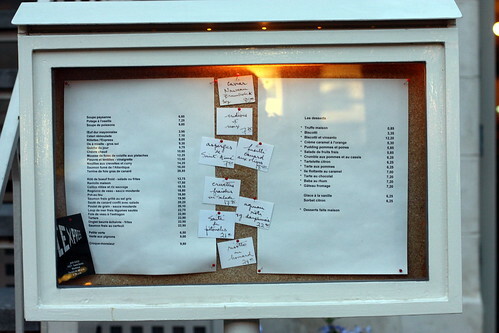 Our original plan was to dine at this Spanish tapas restaurant recommended by our Lonely Planet Travel Guide called Pinxto, but once we were told the earliest reservation we could snag was at 9:30PM, we put our names on the board and went looking for a "snack." Since most of the popular restaurant were located in the Plateau Mont-Royal area, I quickly suggested L'Express, hoping we could somehow snag a 3 top on a busy Saturday evening. With a little luck, our Maître d' told us we had an hour before the next party would arrive and the table was our's if we wanted it. Jackpot! The obligatory bread basket. It wasn't anything special, but it did cure our hunger. 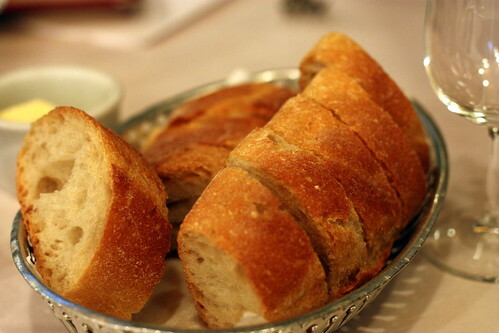 Though one thing I'll say is that why aren't the bread always served warm/hot? It's a pain to put butter onto lukewarm to cold bread. Meh. 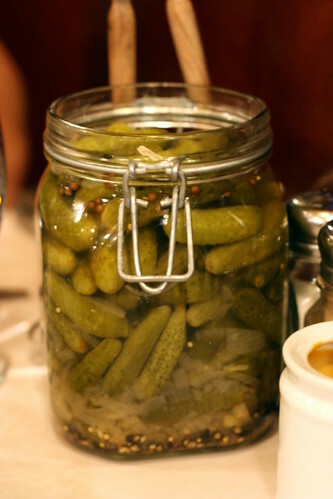 Every table had one of those, but since I'm not a fan of pickles, I didn't try it. 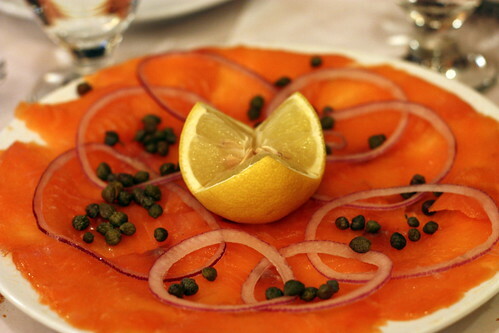 The first of our two appetizers, a dish of smoked salmon served with capers, red onions and a lemon. The dish and flavors are exactly what it should look and taste like. Although it wasn't anything special, eating smoked salmon always makes me happy. 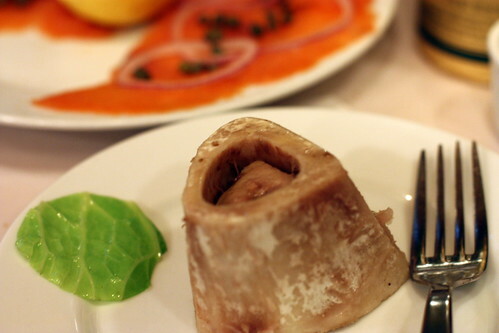 The second appetizer we ordered was the bone marrow. Fatty, rich, and delicious. Served onto of the provided crustinis and some coarse salt, it was definitely a treat, though I wouldn't tell your cardiologist about this particular dish. One of my dining mates ordered the sea bass with sauteed vegetables. While tasty, the preparation and the texture does not match to the fish I've tasted at Le Bernardin or Providence, though at this price, it's hard to argue about the quality. Not bad at all. While I'm not a fan of chicken dishes, the sauce here was the key to the dish. While the flavors are strong, it was definitely needed for this particular chicken breast. Although it was cooked to order, I generally don't care for chicken breast, though the preparation here was pretty tasty for what it is. Although I wouldn't order this normally, it was a solid dish nevertheless. Finally, it was my entree, and when I saw the calf liver on the menu, I knew I was getting it. As some of you may know, I have an affinity for liver, and pretty much most of the organ meats that are available for consumption. The liver itself was done perfectly: juicy, tender, and just plain delicious. 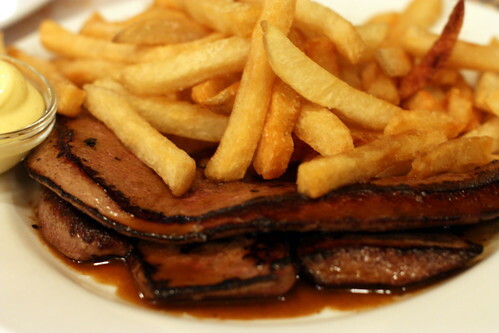 This dish might not be for everyone, but to all you liver fans, this was pretty damn good! I did however, thought the fries were a bit of an overkill on this dish and I probably would have preferred some sort of a sauteed vegetable dish or a rice pilaf. 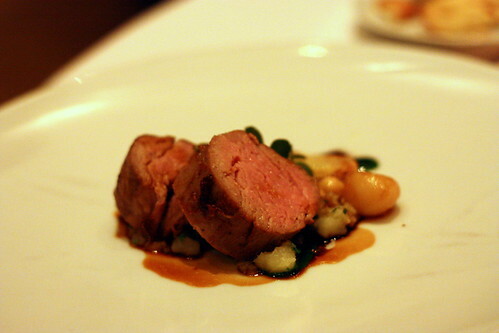 Regardless, I'm getting this again or the veal kidney that also perked my interest. Sadly, our hour was up and we had no time for dessert, but we were off for our 2nd meal at Pinxto, thus it makes most sense to save some room. 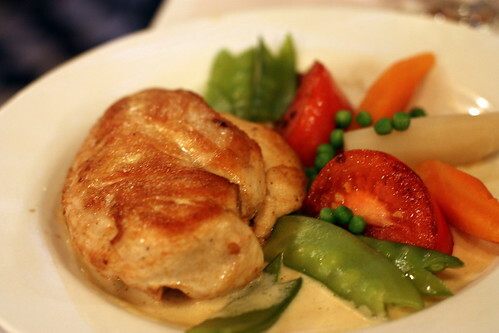 As we bid adieu to L'Express, I was impressed with the quality of food, especially at their price points. 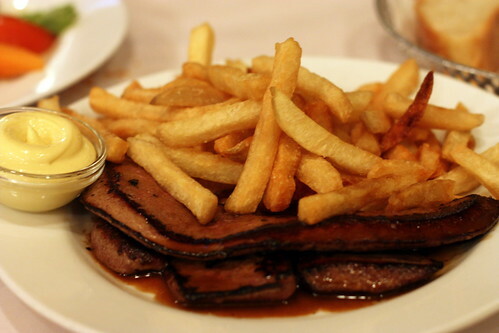 However, it's not a place I'd crave or make a special trip out to Montreal for (unlike Au Pied de Cochon or Toque). I wish I had tried a few more dishes, especially more of their specialties, but I'm sure if I ever make it back to Montreal again, L'Express would again be on my list of restaurants to dine. 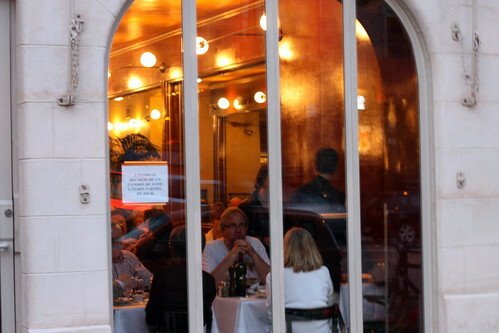 *Note* L'Express opens until 3AM on most nights, so it's a great late night dining options. 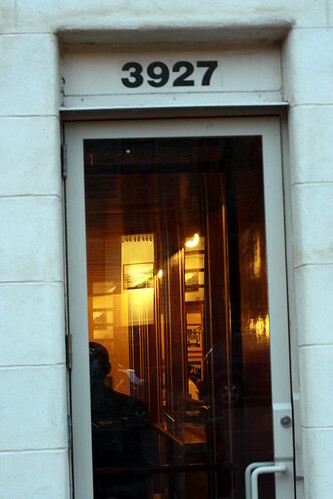 Also, as I stated earlier, booking a reservation here is highly recommended! Here lies the question, "can one have too much of a good thing?" In my opinion, while it's good to take things in moderation, at Petrossian, the rules are meant to be broken. 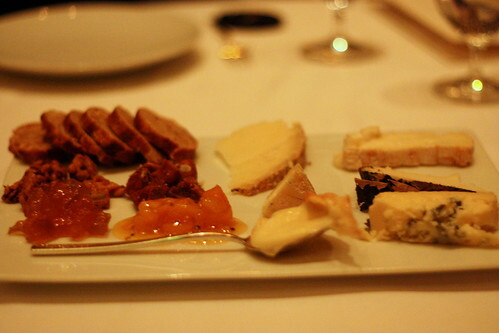 As profiled on my trips 1, 2, and 3, Petrossian has become one of, if not, my favorite restaurant in Los Angeles. On this particular dinner, with the help of the ever so awesome BlackBoardEats, with everything at 30% off, we went with the so called "tasting menu." 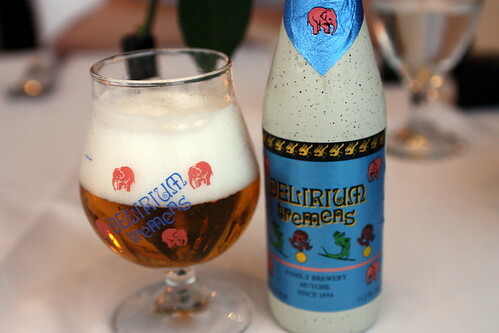 While some in our party went with the Delirium Tremens, a delightful Belgian Brew, I went with the ever refreshing hibiscum champagne. Very nice! 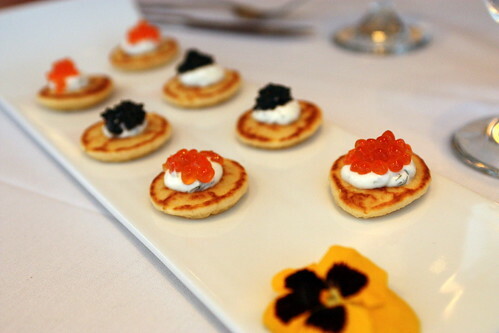 How can you come to Petrossian and not get an order of their famous Blinis with creme fraiche, topped with caviar, trout and salmon roe. Simple, yet unworldly delicious! Beets. Beets. Beets. You're truly not my friend. 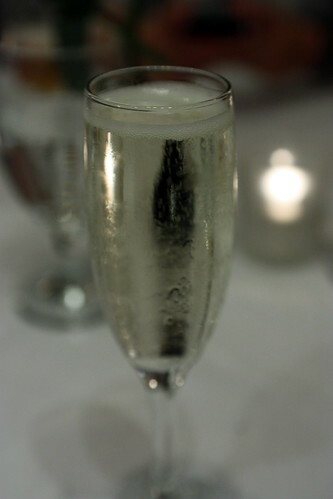 I've tried you many times and I'm rarely a fan, yet here at Petrossian, I could drink you. Some saltiness from the caviar with a spicy finish (wasabi perhaps? ), this I can accept. I may not love you, but I'll accept you. 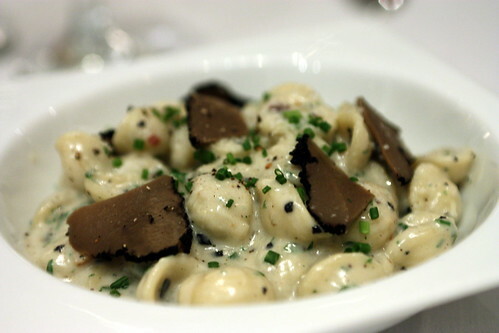 One thing I absolutely love are mushrooms, especially cream of mushroom. 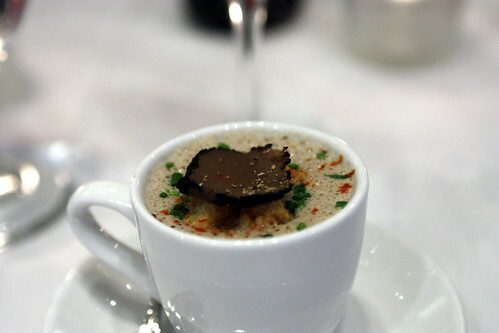 The wild mushroom cappuccino at Petrossian was simply fantastic! 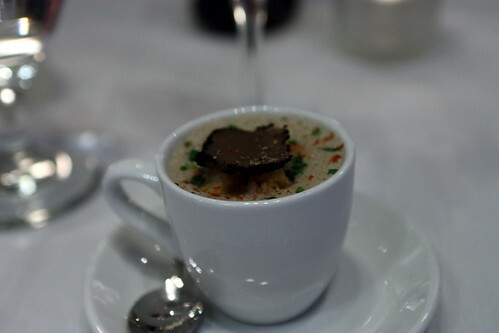 Now as we were served the soup, the server proclaimed "I've never seen Ben shave truffle into this before...." Although it's a bonus having the truffle in the soup, the soup itself is top notch. 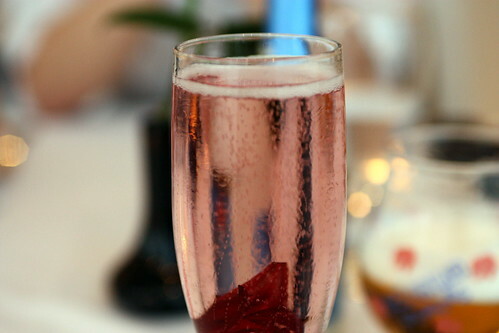 Probably one of my favorite things at Petrossian. Simple, yet delicious. 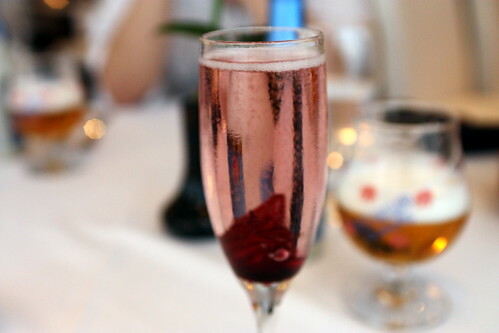 A classic here at Petrossian. I think I've had it so far during each of my dinner visits. You have a well cooked shrimp wrapped in a won ton like wrapper with an Asian touch in terms of the sauce. Very nice. Next, we opted to split a bottle of champagne. Petrossian has a pretty decent selection of beer and wine, which are great compliment to the specialty of the house: caviar. Another favorite for the group, the salmon tartare. Here we're presented with a freshly chopped salmon, mixed with avocado, lime and yuzu, which created a slight tartness in the tartare which was quite nice. 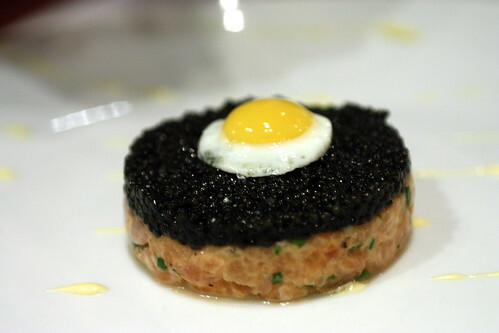 Counter the tart flavor were the saltiness of the caviar and the creaminess from the quail egg, done sunny side up. Once you mixed the flavors together, it was quite harmonious. 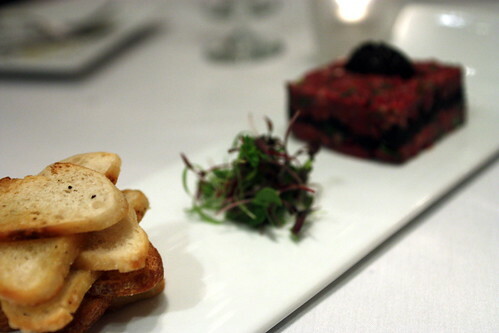 After the salmon tartare we were presented with the steak tartare. This preparation was similar to what I had from my first visit and I liked it even better. 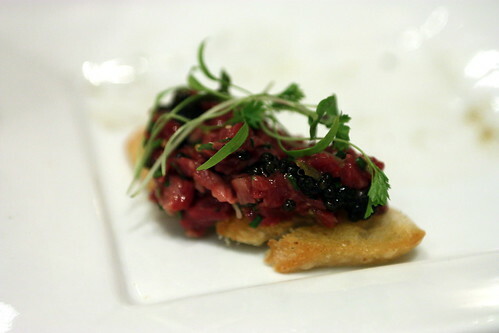 I thought this time it wasn't as salty as the previous visit making this tartare pretty much perfect. 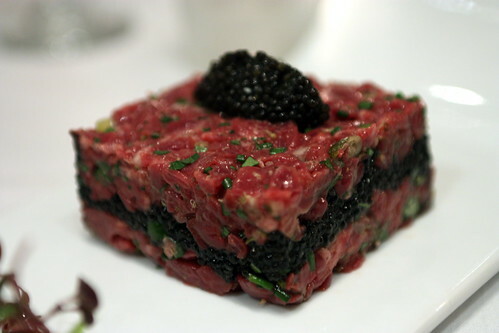 The serving of caviar in the tartare was aplenty and I strongly suggest this dish to be shared among 2-3 people in your dining party. First we had a duel of tartares, now we have a duel of pizzas, more specifically, caviar themed pizzas. 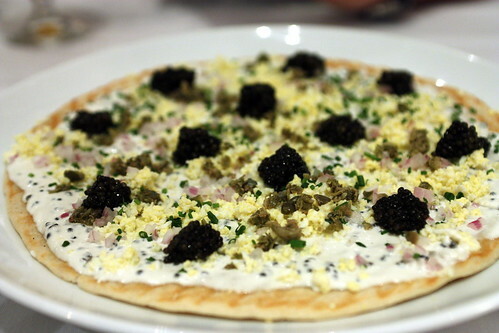 First we have the caviar pizza that I adored on my previous trip. 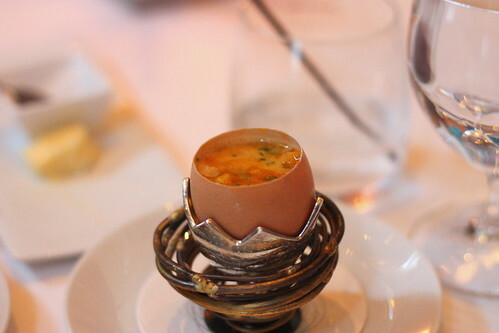 A combination of creme fraiche, eggs, caviar, red onion, and chives, how can that NOT be good? It's friggin' delicious! Following the caviar pizza we were presented with the smoked salmon pizzette, which used slightly similar ingredients as the caviar pizza, but with the inclusion of the smoked salmon. 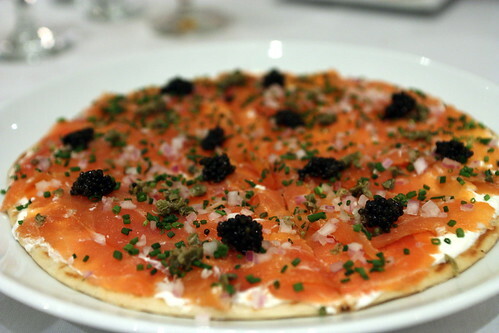 Surprisingly, I liked the caviar pizza more than the smoked salmon version. 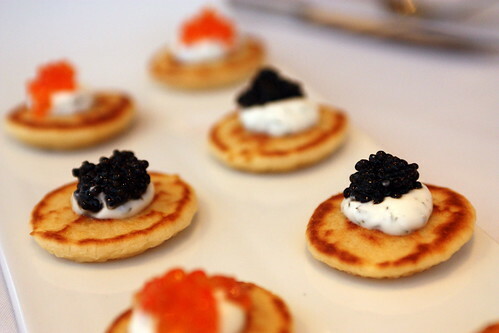 I liked the simplicity of the dish, but with the addition of the luxurious ingredient like caviar, it made it even better! 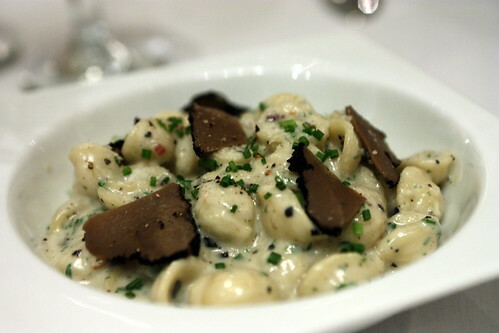 Finally, the last savory course would always be one of my favorites, the black truffle mac 'n cheese. Now, this dish is quite heavy and probably not for everyone, but I love it. The key to this dish was the cheese sauce made of parmesan and bacon. I think the mac 'n cheese would work even better with a simple macaroni pasta to soak up all the wonderful sauce. Regardless, for me, it's almost always a must order, though it's another dish I'd recommend to be shared amongst everyone in the dining group. 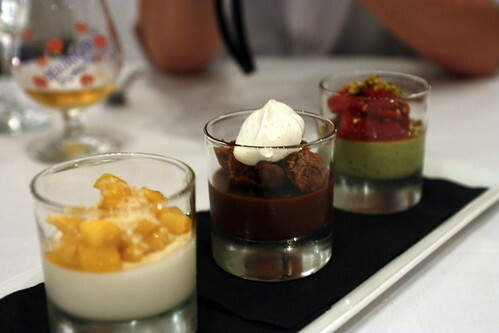 These were the exact same dessert trio that I had on my previous trip, and again, it was fantastic. As usual all 3 desserts were wiped clean by our dining group and I myself could probably clean out the trio personally. 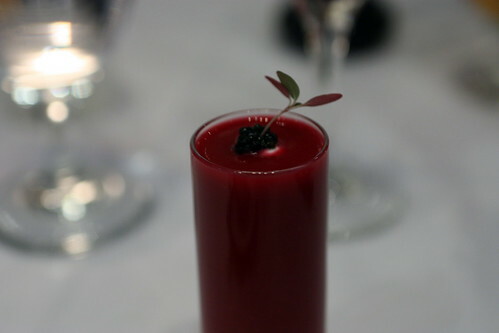 If you want to read more about it, check out my previous trip to Petrossian, but these were simply fantastic! As I look back for the month of June, it's been a Petrossian and Providence duel, and what a fantastic duel. Though in the end, I personally prefer Petrossian. There are lots of unique dishes here and Chef Ben Bailly is always creating new dishes for the patrons like myself to try. 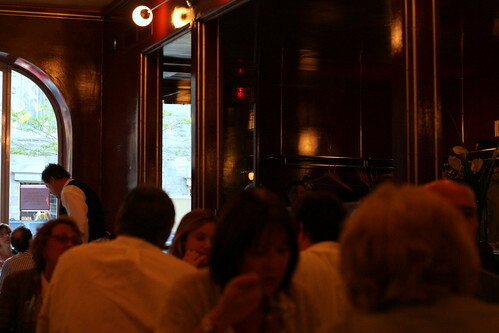 As long as Chef Bailly runs the ship at Petrossian, I'll be eating here again, and again, and again. It's simple as that! 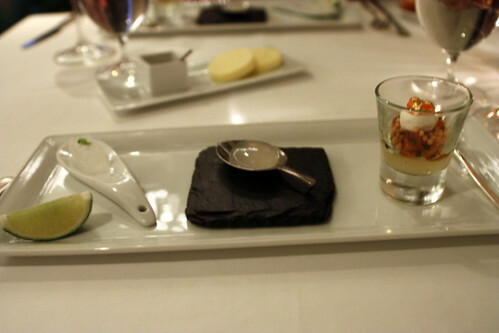 It looks like this will be a my 2nd post in a 4 part Providence series, and while the iron is hot, I'll go over what diners might expect in their 2010 Anniversary 5 course tasting menu for $65. As I mentioned my previous post, Providence is headed by Chef and Owner Michael Cimarusti who specializes in preparing elegant, yet delicious seafood dishes. While I wasn't "wowed" by my visit last year for their full tasting, I was excited to try Providence again with Diana of DianaTakesaBite. 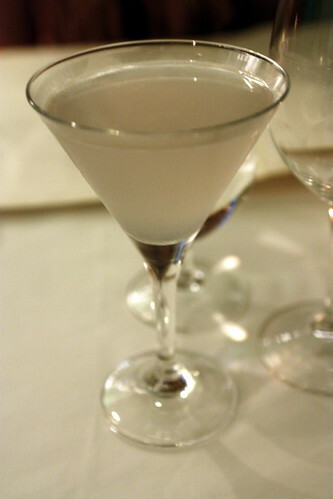 While going over the menu, I started off with a gin based cocktail called The Aviation. The drink has a nice bite, yet still refreshing. It went pretty well with the upcoming tasting menu. 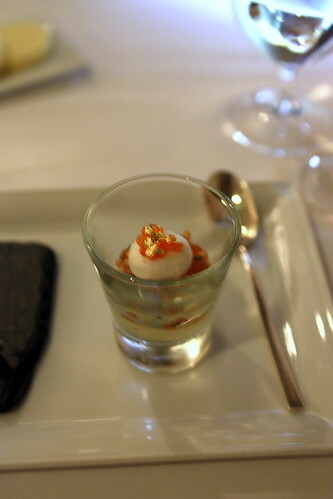 The trio were all refreshing and delicious, though my favorite has to be the cured trout with trout roe and a wasabi marshmallow. It was simple, yet flavorful and delicious. 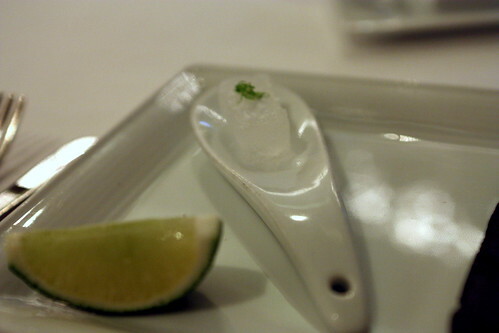 The "Gin and Tonic" I had previous on my last trip and the flavors are activated by a squeeze of the lime. It was icy and intense. Finally, I've had the liquid sphere on all my trips to Providence, so this was no exception. However, I've had the Greyhound and Mojito previously, and this was my first taste of the "Margarita." It definitely have the taste of tequila present in the sphere. Very nice! 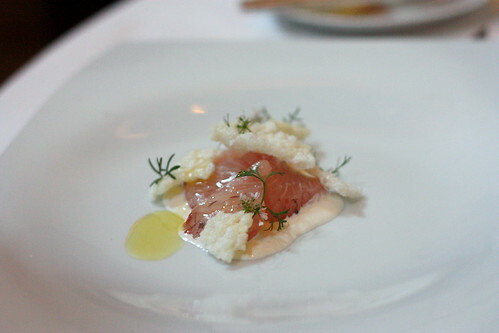 We started off with the same starter as last time, the kanpachi sashimi. I appreciated the freshness of the fish used, and like last time, I enjoyed the texture contrast of the rice crackers and the creamy finish of the creme fraiche. The slices of fish were cut thick which I enjoyed, though Diana didn't like the texture as much as I did. 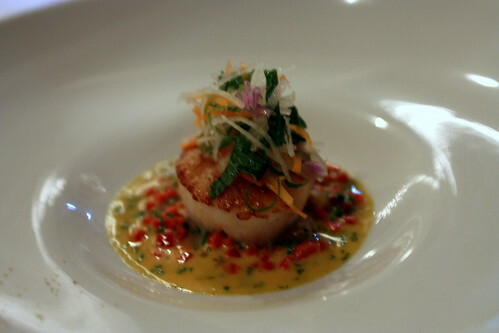 Although I liked the preparation of the scallops on my previous visit, I thought this time was event better. I enjoyed the eggplant compliment and the creaminess of the sauce. The cashews added a nice texture contrast to the scallops. As always, the scallops was cooked to perfection! Pulling a page out of kevinEat's repertoire, we added this supplemental dish, the Spaghetti alla Chitarra. Knowing that we were sharing, they split the dish nicely for us and each plate was filled with ample amount of pasta, spot prawns and sea urchin. 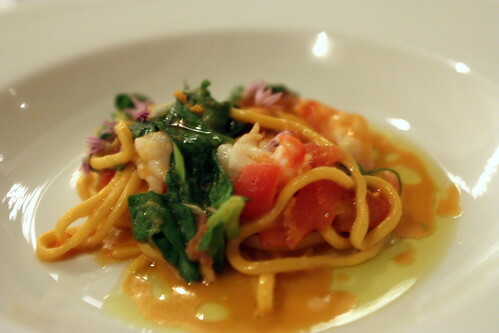 I really enjoyed the taste of the sea urchin in the pasta and the sweetness from the prawns. Also, for those people that don't want to pay top dollars for a sea urchin pasta, I'd recommend visiting Spoon House in Gardena. That's where I usually get my Japanese style sea urchin spaghetti. Even though I dislike olives and was slightly worried the inclusion of it in this dish, it wasn't a big issue. The halibut was cooked well and the squash and the basil I loved as the compliments to the halibut. I liked this much better than the halibut dish from last year. After not being a fan of the veal and seeing it on the menu, Diana and I both asked for a substitution, and I'm glad we did. This was probably my favorite dish of the night. 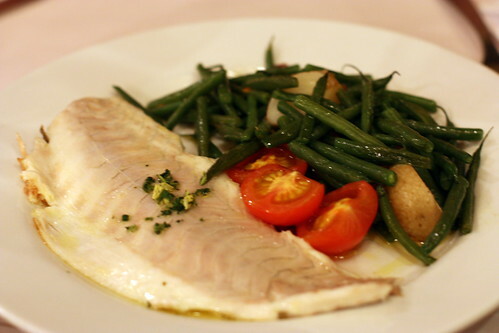 First, I enjoyed the fish with a well cooked, crispy skin, yet the fish itself is flaky and tender. 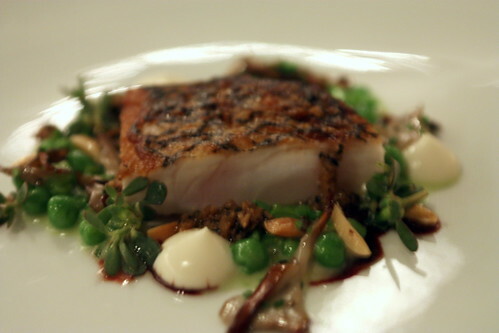 In addition, I loved the use of the peas to bring out more sweetness from the fish itself, while the mushroom added a nice woody taste. The balsamic glaze added a nice flavor contrast to the sea bass, as well as the sweet peas. All in all, a winner! 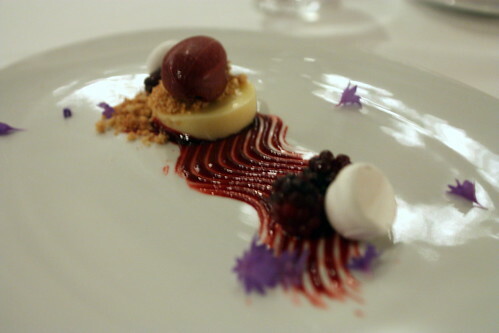 Eating this dessert really makes me want to return for Providence's 8 course dessert tasting. 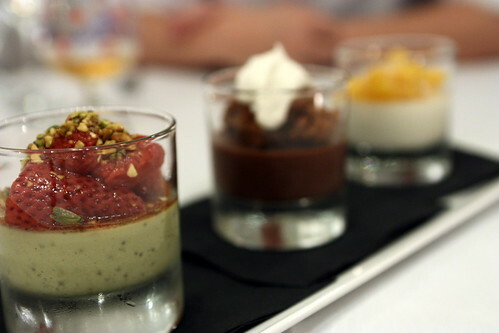 I really loved the tart flavors in this particular dessert. 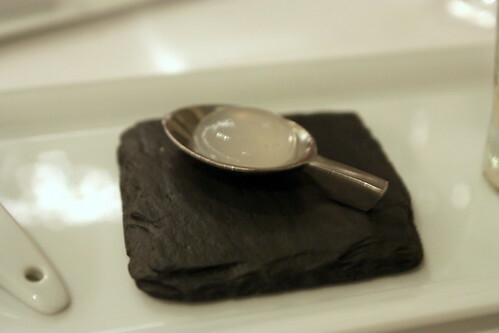 The blackberry/jasmine sorbet was fantastic, and the yuzu curd really put a nice ending to the meal. One of my favorites I've had here. Finally, a trio of sweets to cap the night off. 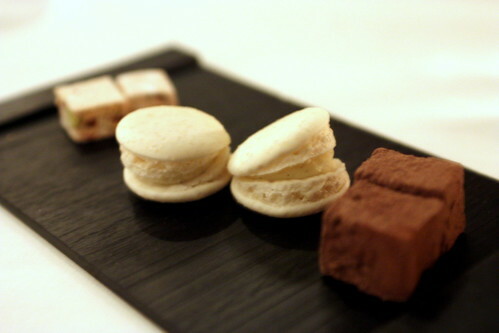 A pistachio nougat, white chocolate macaron, and a spiced chocolate marshmallow. All three were quite nice, but my favorite in the group was the macaron, though I seem to like any macaron I eat. All in all, it was a fantastic meal, much better than I had expected going in. Although I enjoyed Providence on my previous visits, this was probably my best dinner experience yet. The 5 course dinner special is a great deal at $65, especially for the caliber of food being served. 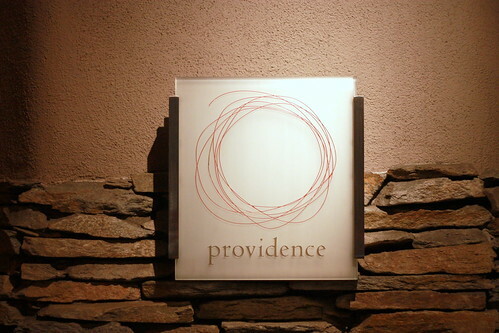 Although my next trip will be for the 8 course dessert tasting, I can definitely see myself coming back for another full tasting at Providence. You'll have until the end of June to take advantage of their 5 year anniversary special, so it's definitely worth the money and your time. Do it! 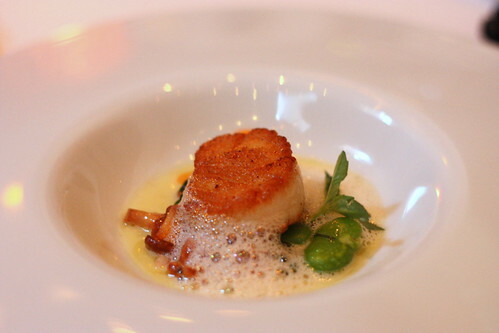 Providence, a place I've dined a few times in 2009, and this dining experience was about a year ago during their 4th anniversary dinner special. Call me a slacker, or having a huge blogging backlog, but here it is! This will be my Providence marathon 1 of 4, which will also include my upcoming dinner there this weekend. 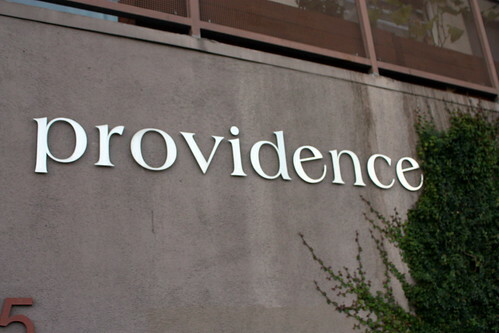 Just a quick Providence background, after Chef Michael Cimarusti left Water Grill to open his own restaurant, the aforementioned Providence, it has quickly garnered numerous awards, including 2 Michelin stars in 2009. Chef Cimarusti specializes in seafood and we definitely experienced that passion in our meal. Prior to ordering and in place of a wine pairing, I went with a version of Gin Gin Mule made at Providence. Refreshing and delicious, just what I needed! 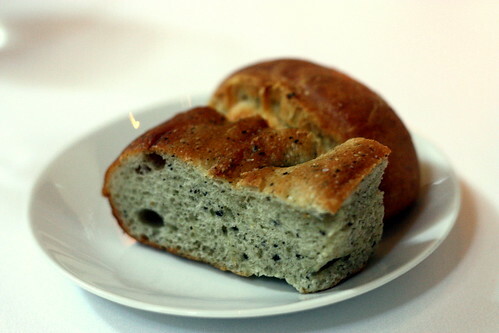 There are two types of bread offered at Providence: A simple warm roll, and an olive focaccia. Even though I'm not a fan of olives, the subtle taste of the olives in the focaccia left this non-olive fan pleased. 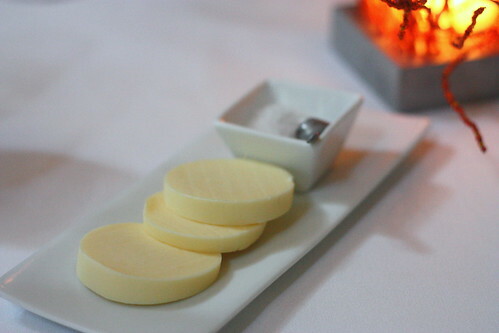 As usual, I enjoyed the salt and butter compliment with the bread here at Providence. 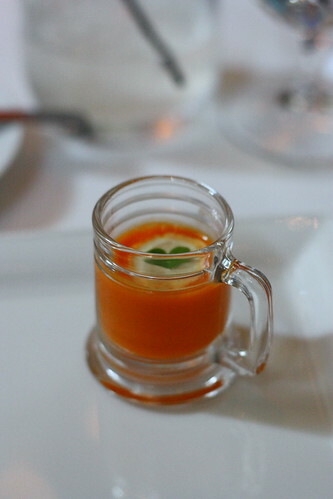 An intense, yet delicious carrot soup with a slight touch of creme fraiche. Delicious! 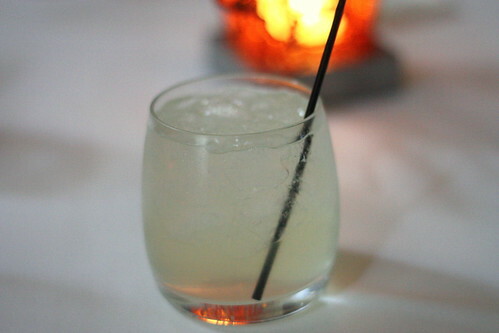 Here we have Cimarusti's play on the classic gin and tonic cocktail. 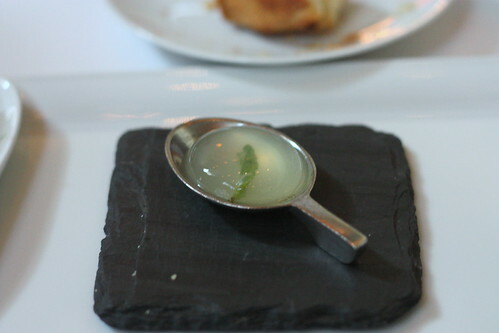 Served jelly cube with a slice of lime on the side. Very nice! Probably my favorite of the trio, but it's probably due to the fact it's my favorite cocktail, a mojito. 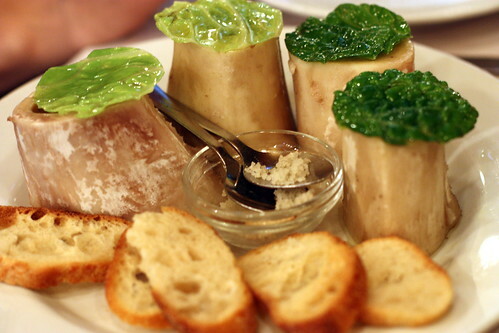 Served in a style like Bazaar's Olive, it's served in a gelatinous form with a liquid filling. 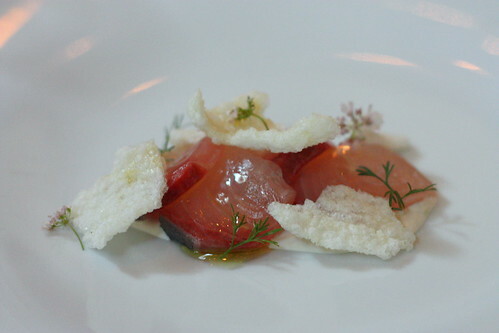 It's very enjoyable and a nice palate cleanser to prepare us for the upcoming tasting menu. 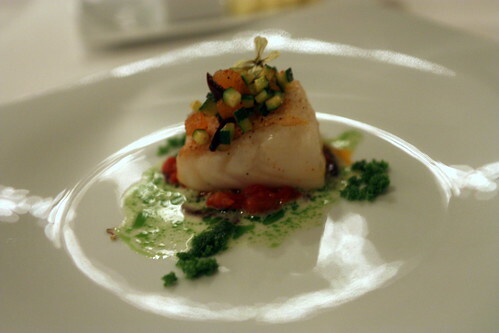 Here, we can see Chef Cimarusti's approach towards fresh seafood. Unlike the usual sashimi preparation found at a Japanese restaurant, the addition of the rice cakes added a nice texture and the creme fraiche added a nice tart, yet creamy flavor. 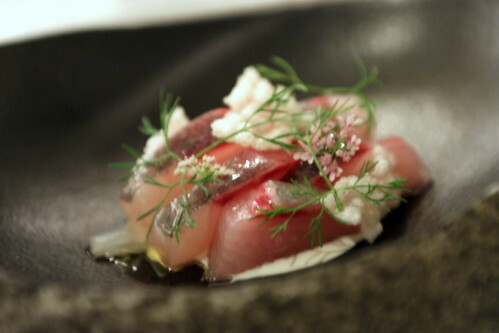 However, in the end, the dish is highlighted by the freshness of the kanpachi, and it was quite nice. Fresh Santa Barbara sea urchin and fresh soft poached farm egg, what can really be better than this? Ya, this is good, really good! It's probably the best dish of the night, easily. Next, we were served a beautifully cooked scallop from Hokkaido complimented with bacon and chanterelle (a type of fungus). 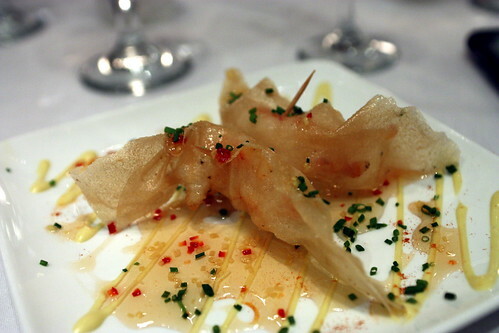 The flavors of the bacon were evident, yet did not steal much of scallop's thunder. A wonderful match! The star here was the halibut. 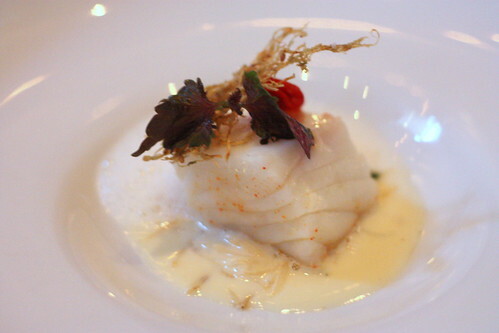 Cooked beautifully sous vide style, the fish was delicate and tender, and definitely well cooked. I also enjoyed the compliment of shiso and lemon in terms of flavor complex, though I wished that the flavors would be a bit more bold. While I enjoyed the dish, I didn't exactly love it. Maybe it's due to the fact I'm usually "so-so" with regards to salmon dishes. 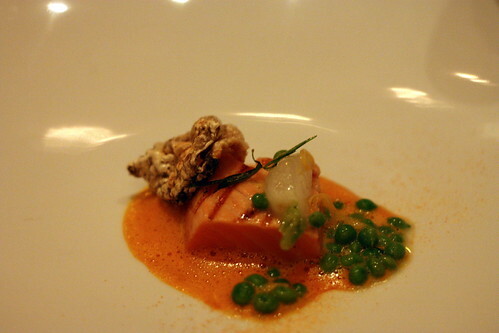 What I did enjoy was the salmon skin that came with the dish, the peas itself, and the sauce that went with this dish. The salmon was well cooked, and the accompanied dishes added to the flavors, though I don't think I'll be craving this anytime soon. I'll be fairly blunt when I say the seafood dishes definitely trumps any "land" courses at Providence. While I usually enjoy a properly cooked veal, I did not like this preparation, and neither did anyone else in my dining party. The veal itself was tender, the textures seemed off and while I was able to finish the dish, I didn't particularly like it. 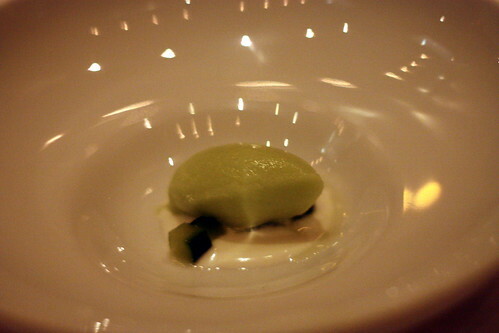 I think this is a case where the picture looked better than how the dish actually tasted. 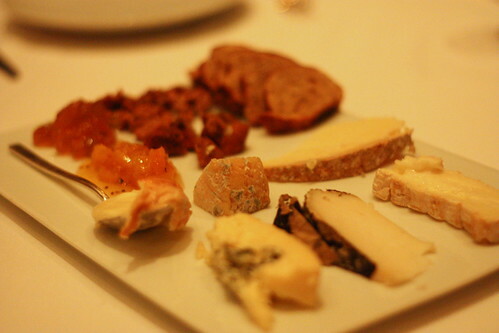 The cheese course, one part of the meal I usually dread as I'm not too keen on cheese in general. 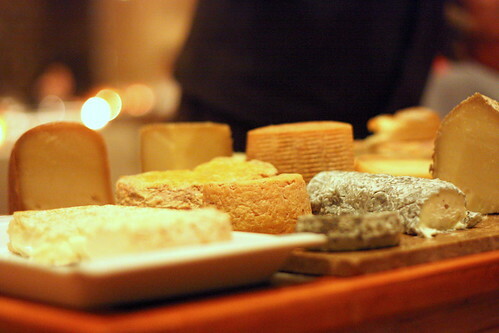 I will have to say, the cheese cart at Providence was quite impressive, easily one of the best in Los Angeles. 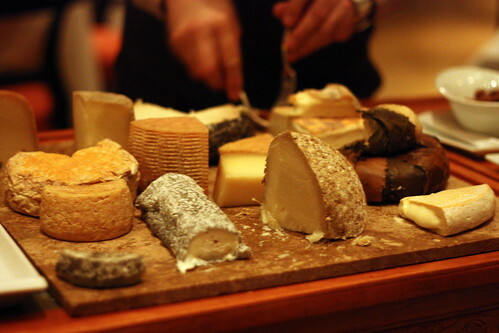 We were given quite a few choices for the table and our cheese specialist was quite knowledgeable and was able to give us a nice sampling of the cheeses available that night. While I didn't enjoy them all, it was an impressive sampling for sure. Now...onto my favorite course in every meal, the dessert course. 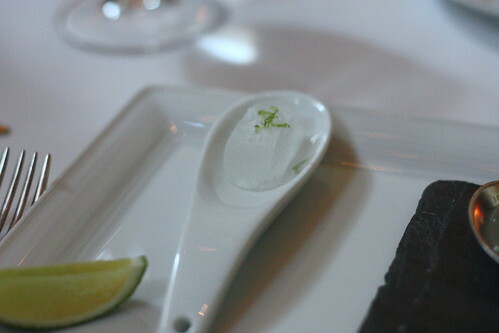 To start, Pastry Chef Adrian Vasquez served a Kaffir lime sorbet with cucumber and yogurt, a quintessential palate cleanser. 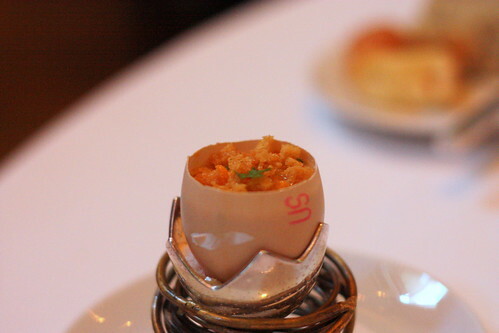 The dish was refreshing, light, and a great choice for us after the numerous savory dishes. Our final dessert course was the cheesecake. 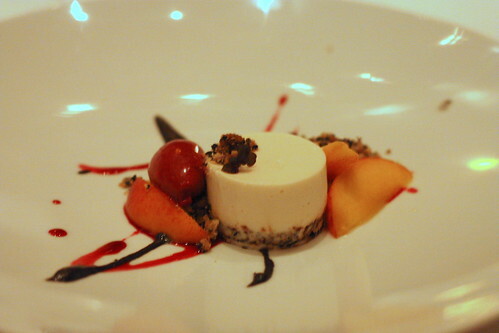 Usually cheesecake is one of my favorite dessert options and this proved to be no exception. I'll say, with the inclusion of miso paste within the cheesecake, it's slightly on the savory side, however the accompanied peaches and cassis sorbet did help combat those flavors. While I enjoyed it, it wasn't my favorite cheesecake I've had. 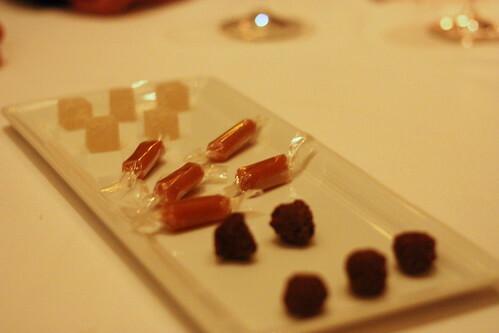 Finally, we closed dinner out with three different types of mignardises (jelly, caramel candy, and truffle chocolate). Each were tasty and delicious. A great way to close out the meal. For my first full tasting menu here at Providence, there were a few standout dishes, while a few I feel missed the boat. While I do believe Chef Cimarusti and the restaurant deserved its 2 Michelin stars back in 2009, it's not my favorite restaurant in town. I hope my upcoming visit will change my mind, though I did have a nice experience here. 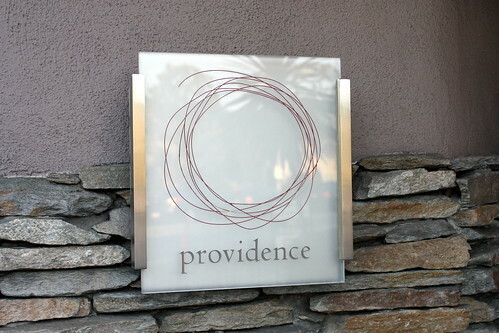 For those that would like to try Providence for the first time, they're having their 5th Anniversary special for the month of June, as the 5 course tasting menu will be set at $65. Quite a bargain if you ask me, and it allows me to try Providence one more time!